The lavender albino python is a rare genetic morph of the ball python. Their pretty pastel coloration has made them highly valued among snake enthusiasts. They're defined by their pale lavender background scales with golden markings and ruby red eyes. Care for lavender albino pythons is the same as for other ball pythons. Lavender pythons (Python regius) are a form of albino ball python, but with lavender base color rather than white. Albinism is caused by the body's inability to produce melanin, the pigment in skin that protects it from UV rays. In lavender albino pythons, the yellow markings are often deeper and richer than in the regular albino. Regular, high contrast and lavender albinos display tyrosinase-negative (t-) albinism. Hatchling and juvenile high-contrast albinos may have lavender or other pastel markings, which they lose by the time they reach adulthood. Conversely, true lavender albinos start white and often won't develop their lavender base color until they're mature. 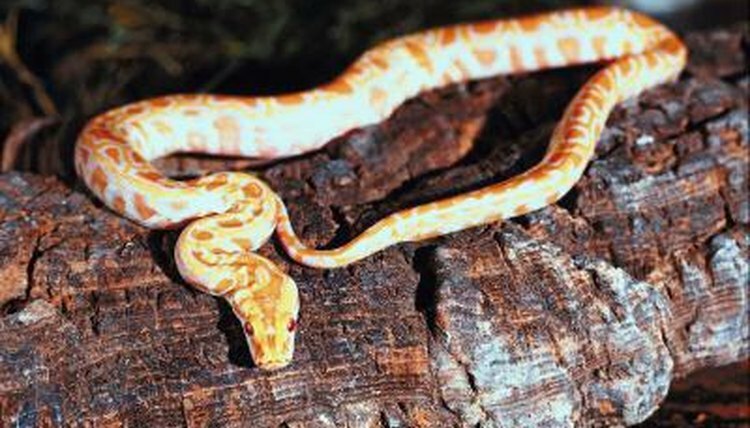 Caramel albinos are pale yellow with gold and grayish-purple markings, ruby eyes and pink tongues. Because the caramel albino possesses more coloration, it is thought to have tyrosinase-positive (or t+) albinism. Despite being easy snakes to keep, ball pythons weren't popular in the herp trade until the 1990s. Common ball pythons often sold for only $15 to $20 each. In 1992 the first albino ball pythons were sold in the United States for $7,500 each. After that, interest grew for Python regius, and the desire for rare breeds escalated. Now dozens of ball python variations are available in the pet trade. The more popular these snakes become, the more morphs develop, including the various albino types. Python regius originates from western and central Africa. Between 30,000 and 50,000 ball pythons are exported from Africa annually for sale in the exotic pet trade, according to the University of Michigan's Animal Diversity Web. Trappers report that they've found albino ball pythons and other morphs in the wild. They are terrestrial snakes that spend most of their time in burrows or on the ground. Ball pythons live in grasslands and forests. Python regius is known for its ability to wrap itself into a tight ball as a form of protection. Ball pythons live about 10 years in the wild, but can live 20 to 40 years on average in captivity. Ball pythons became popular pets because they're easy to handle and reach an average size of 3 feet, with a maximum size of 6 feet, which is manageable for most pet owners. Ball pythons feel more comfortable in an enclosure that's not oversized. A 30-gallon terrarium is sufficient for an adult ball python. A hiding box is key because ball pythons spend much of their time hiding in burrows in the wild. Ball pythons are tropical snakes that need a heat gradient and require humidity of 50 to 60 percent. A terrarium light isn't recommended for albino pythons. Plain shredded paper, orchid bark and cypress mulch all make good substrates for your terrarium. Ball pythons eat rodents almost exclusively. These snakes only need to eat once a week or every other week, and may eat less depending on the time of year and shed cycle. Pythons need a dish of clean water at all times. If the dish is big enough, the snake will enjoy taking a dip in it now and then. Clean the terrarium regularly and completely disinfect it monthly. Gently handle your Python regius regularly to tame him. Once the snake learns his handler is a friend and not a threat, he'll most likely learn to enjoy hands-on interactions. What Does a Full Size Corn Snake Look Like? How Big Does a Dwarf Boa Get?